Protecting Invasion Fleet from Kamikaze attack? Its been a while.. What is the best way to protect fleets from Kamikaze attacks. Status: offline Lots and lots of CAP. I don't know that it makes a difference in this case, strictly in terms of air defenses anyway, but keeping your TFs to 2 CVs and 1 CVL each such that you have 6 TFs may be diluting your shipborne AA defenses. It depends on how many ships you have in each TF. You could try remaining at longer ranges at first as well, meaning only the longer ranged planes will reach you and you may be able to shoot most/all of them down. Another thing: are you playing with the updated databases? In the scenarios that are part of the game as installed, shipboard flak is not as good as it should be. In the DBB scenario or in Andy Mac's scenario updates (which you can find in the tech support forum I think), Allied shipboard flak in particular is much better and closer to reality in performance. There is your problem. Do not sail near the AI-held Tokyo. Aviation is massed there, and it will eventually tire up and exhaust even the most sturdy CV CAP. There are plenty places on Honshu to land out of range of main Tokyo furball. Even better to land somewhere on Hokkaido or Kyushu first to have airfields for land-based CAP. Status: offline Big Blue Blanket. Status: offline they posted lots of DE's and DD's on the approach vectors. Iwo Jima and Okinawa in particular. One ship posted a sign saying "carriers ->" . there is a technical term for those who confuse the opinions of an author's characters for the opinions of the author. Status: offline By all means stay away from Tokyo--that's suicide. But to approach the periphery, first set up a Kamikaze trap with massive amounts of your best cap and bait it with an old beat-up light cruiser and one or two destroyers. You can trade 50 vp in ships for 200 vp in planes (and pilots). Eventually the kamikazes in the specific location become less effective, but you can also run him out of experienced pilots and maybe out of airframes. Always count the waves, and how big each wave is, and which wave is it when your cap stops fighting. It works best out of Fusan, but it is possible to run it out of Shanghai, or Okinawa and probably somewhere in the north. This works like a charm against the AI. A human will make it more challenging by standing the Kamikazes down part of the time (and carefully managing his pilots), which would be countered by risking a naval bombardment (with ships you can lose and long range cap). Many HI airfields are susceptible to bombardment, and the other get bombed. In short, you can't just charge in. You have to sneak up in almost the slowest way imaginable. Status: offline I would concur with everything written above. Also set the fighter CAP at 100% as you close ?? Set shorter range on fighter CAP i.e. range 1 if the Carrier TFs are trailing the invasion fleet by 1 hex ? 2) I assume you have Iwo Jima Chichi Jima for example ? Place your P47s and P38 on LR CAP - 80% at least (20% rest due to fatigue) and or Sweeps. Better still there are / were great squadrons of F4U1 Corsairs with compliment of 36 fighters - Marines - and you can train them up from 1944 to be practically all TRACOM level ! If you don't have them setting on Carriers use them to LR CAP and sweep. 3) Use your CV TFs and CVE TFs to set up a CAP trap range 10 away from Tokyo... let them fly at your Carriers by the 100's and be shot down by the 100's to "thin the herd"
Use a squadron of Destroyers from your plethora of DDs to entice them to attack and LR CAp over them. Fletcher's have high survival rates from CAP traps. You might take some damage on DD or even CV - but you are unlikely to loose the ship at the late stages. 4) At the end of the day there still may be 1000's of fighters congregate in Tokyo. Perhaps too many even after thinning the herd ; BUT also dependent on how 'damaged the Japanese economy is vis a vis supply'. Against the AI you can 'bankrupt' the AI supply economy on the home islands - although the ground forces still fight back behind potent fortifications. Land away from Tokyo and march to the capital to take it. Status: offline I once sailed a mid-43 Death Star in the range of Nasty Ironman Tokyo by mistake. Well, more like a baby death star yeah, cause most of Allied CV strength is not out yet by mid 43. Yet, all available CVs/CVLs were there filled to the brim with best planes and pilots ATM. I once sailed a mid-43 Death Star in the range of Nasty Ironman Tokyo by mistake. Well, more like a baby death star yeah, cause most of Allied CV strength is not out yet by mid 43. Yet, all available CVs/CVLs were there filled to the brim with best planes and pilots ATM. Yes as always I should have prefaced remarks with "it depends"
I can see that 43 would be problematic. 2) You are flying F6F 5s and or even Corsairs off the flattops - not just F6F 3 or a mix of F4F Wildcats. The CVE's have at least FM1s or better still FM2s aboard. 3) Pilot experience is universally high among groups. All these little details always make the answer situational - which makes this such a great game. In defense of the AI ** the AI plays defense well ** at end game. very late 44 early 45 - the AI will have solid mixture of troops behind very stiff fortifications on the home islands - including Iwo / Chichi / Okinawa etc. They key was "bombarded once" or maybe twice with invasion. 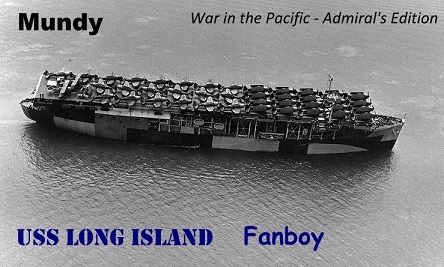 Works okay with Guadalcanal or Tarawa in 1943 - not so much latter and closer to the home island. Status: offline One little bit to add - embed your fast battleships into the CVTFs - they are great AA platforms, they attract attacking planes as much as carriers do and they soak up hits much easier than other ships! Leave your slow BBs for bombardment and CAs/CLs for surface action. With 4 Iowas, 4 South Dakotas, 2 North Carolinas, 2 Alaskas plus 2-3 King George Vs, Richelieu, Renown you should have enough to fill every TF with 2-3 BBs/BCs. You should keep your Carrier numbers higher with lower number of CVTFs - US used 3-4 TFs on forward line (one always refueling) and rest cycling through rest/repair/base/forward area + one UK TF. One little bit to add - embed your fast battleships into the CVTFs - they are great AA platforms, they attract attacking planes as much as carriers do and they soak up hits much easier than other ships! Leave your slow BBs for bombardment and CAs/CLs for surface action. With 4 Iowas, 4 South Dakotas, 2 North Carolinas, 2 Alaskas plus 2-3 King George Vs, Richelieu, Renown you should have enough to fill every TF with 2-3 BBs/BCs. In 1945, I have used CV TFs made up of 6 or more CVs, salted with a few CVLs. They're almost certainly going to be spotted anyway, so the TF of 25 ships (filled out with 1-2 BBs, 2+ CLAAs, CA/CL as available, and the rest high-AA/high-Endurance DDs) being really easy to spot isn't important. And yes, running CAP up to 80% or more, even 100%, is the optimal way to do things. I know some will argue otherwise, but they ain't got no proof. I've got anecdotal experience that it's the best. .... I know some will argue otherwise, but they ain't got no proof. I've got anecdotal experience that it's the best. I admit to being 'beholden' to history somewhat or a lot. You know me an probably appreciate that fact. This discussion - your thoughts - made me think. I run my Carrier TFs - much as Spruance is often quoted - very much 3 CV 1 CV as best as I can manage (sometimes 2 CV 2 CVL for the runt TF last put together) - with CA CL DD and CLAA ! I failed to mention them - there are usually 'just enough CLAA for 6 TF in early 45 as I recall. Further my DD are exclusively Fletcher Class. Equally I tend to run my BBs in a Fast Task Force with the CV Task Force - 'and mostly in the same hex'..... 3 X BB CA CL and DD. I have never placed BB in the CVTF in my 2.5 full games. Anecdotally - I have seen the Japanese Air Units attack the BB Squadrons. Perhaps as much as the Carrier TFs. Perhaps a little less so. With my CAP up I sort of though 6 of one half dozen of the other. Is it your opinion that the embedded BB attracts more attacks ? I am guessing it intrinsic AA value is more optimized within the CV TF ? Status: offline If both TFs are detected equally, I don't know if the embedded BB in the CVTF is more likely to be attacked than the BB in a separate SCTF. Maybe. However, the CVTF is a bit more likely to be detected, or at least detected with a high DL, and even in cases where there is equal detection the CVTF is going to be prioritized (assuming other thresholds are met, like aggressiveness, willingness to send a raid against CAP, etc.). Beyond that, when being attacked (unless I am missing something) I don't think BBs in a separate TF will contribute their AA to ships under attack in the CVTF. Also, you can always just break the BBs out of the CVTF to go hunting or bombarding if you want to. I'd rather run extra DDs in a separate TF than put extra DDs in the CVTF while having the BBs separated. If your CVs somehow get engaged by surface forces, having the BB guns will be invaluable there as well. Granted you can't split the BBs out of the CVTF mid-turn, but that's not really much of an issue. And of course, you eventually get 10+ fast BBs (USN and others), which is more than enough to be able to use some in CV TFs and others in SC TFs. Any TF with >15 ships takes a AAA hit. How much that is I've no idea. It isn't an absolute hit. Rather beyond 15 ships there are diminishing returns from the additional ships. Ah, OK, as with most things AE. Thanks for the clarification. If you can keep few Destroyer Squadrons near the carriers with decent surface commander, it is just a few clicks to draw BBs from CVTFs to SCTF and back as needed. BBs can even cycle on bombardment using their main ammo and returning to the CVTFs just for the AA duty. Big CAP - 70-80% with range 0-1. Sweep with only few units in time, keep your bombers out of CAP heavy situations, spread at altitudes from 5000 to 30000, Watch fatigue level of pilots/planes. Retire when necessary for a few days of rest. BBs can even cycle on bombardment using their main ammo and returning to the CVTFs just for the AA duty. You never stop learning in this game. Much of what you both have suggested I practice. Cycling the BB / nearby DD is a new thought that never occurred to me and frankly I operate that way with pickets anyway. It is a really interesting suggestion that I sort of missed preferring organizationally to have the BB operate 'separate but equal' within the 1 range hex so to speak. However that strategy is more set piece when you know its coming - both your suggestions are likely more practical in the majority of instances. Status: offline CV TFs are most certainly a prime target, but the game seems to treat Amphib/Transport TFs with troops aboard as equally valuable. Most of the CV clash disasters I have seen in AARs happen when one side's CV strike goes after the transports while the other side's knock out their carriers. Once the carriers are knocked out, the side with carriers remaining can dominate the battle area unless there is enemy LBA really close by. Status: offline In RL the Kamikaze's became a serious problem. One tactic the USN employed with some success was to set up small picket flotillas of expendable DE's and old DD's just ahead of the main carrier task forces, in the most likely opath that the Kamikaze's would take. The inexperienced Japanese pilots, upon sighting their first USN ship, would tend to immediately peel off and go for the earlyt argets, rather than to stay in formation and fly over looking for bigger game. This tactic did work, although the crews of the picket-destroyers had more than a few words to say about the stratagem.,.. In RL the Kamikaze's became a serious problem. Well to the "Expendable DEs and old DDs" - mostly DDs of Fletcher and Allen M.Sumner were used - also the ships picked for such duty usually had the best radar available fitted to detect and guide CAP. A picket station usually contained 1-3 DDs, with some LCI(S)/LCS - with smaller ships used for AA support and fire fighting (as well as rescue work). I doubt many DEs or 4 pipers were used on that duty (DEs had either 2x5inch or 3x3inch as main armament, while most DDs had 4-6x5inch guns). Also it was mostly Fletchers that got the "Kamikaze upgrade" - the fwd torpedo mount was landed and two twin-Bofors 40mm were substituted for quads. The USN Laffey DD724 - the famous radar picket that would not die - was a Sumner Class. Sumner's being an actual 'improvement' on the Fletcher class i.e. being the next generation. I am not qualified to argue the merits of 'better than Fletcher's in detail - simply just stating conventional wisdom. I too strongly doubt any Benson class or Sims class were ever used as pickets. In fact many of my earlier class DD end up as the escorts in Cargo Convoys / Troop shuttle missions. By end of 44 you have enough Fletcher's to set up picket task forces (i.e. 3 ships) to 'precede ahead of TF58' and "ASW clear" a path' or attract Kamikaze attacks. The better DEs being embedded in CVE flotilas supporting an invasion or also on ASW patrols around key bases. Status: offline Setting up the Fleet for the end game creates the dreaded Death Star. In PBEM games this has proven to be a virtual game ending strategy: especially when the US CVs no longer need many TB, DBs, and can load up with fighters. To counter these unhistorical fleet sizes I have seen HR's to limit the number of carriers in any TF to 4. I like to follow historical doctrine and practices, because it was extremely difficult to coordinate large fleets to efficiently launch and recover planes. The famous Taffy fleets had 6 CVE each and the US main carrier TFs had 3 - 5 CV's for most engagements. What then is a good HR to give the IJ player a real chance of scoring hits on US TFs? Status: online Loka is right. Kamis can get through Death Star to score hits, though losses are usually high. Players have a real issue with Death Star. Since I'm a Death Star aficionado, I hear a lot of the grumbling. But DS isn't the problem, it's the solution. By 1944 and 1945, Japan can have a massive air force in state-of-the-art aircraft handled by elite pilots. This air force has plenty of fuel and often may have a network of interlocking, huge bases. The result is a threat about 3,000 times what the Allies actually faced in the war. So it behooves the Allied player to adapt and take appropriate countermeasures. Kamis can get through Death Star to score hits, though losses are usually high. But DS isn't the problem, it's the solution. By 1944 and 1945, Japan can have a massive air force in state-of-the-art aircraft handled by elite pilots. Not historical, but it happens. Therefore I have no problem with the DS. Of course as a JFB I'd rather not see it. Seriously, what's the Allied player supposed to do, walk calmly to his doom. No he creates the DS to counter a tougher Japan. Status: offline Granted, DS is a very valid tactic. It is also a psych. tool because the IJ player knows the end is near and he has no Ruke Srywacker, no magic burret or other nuclear VunderVeapons. More IJ players would play longer if they could face four 12 ship CV TF in a hex versus two 25 ship TF. Really puts the fear into the AFBs (as previously noted) and slows the final invasions. More games would go closer to '46 and give the IJ player a real chance to complete the R&D cycle. Our Southern European friends have also found the game to be much more wide open. The game does not stall in mid 42 -43 as carrier strikes are smaller and less lopsided: BOTH sides actually score more hits. You repeatedly see in AARs that carrier battles are unusually lopsided, predictable affairs, favoring massive CAPs. Everyone has had their share of disastrous carrier battles AND they get no hits. Since the game engine has no naval targeting system, and was not designed for large (non-historical) combat TFs, it seems the best solution is to offset the flattop numbers game and give the smaller flights and un-escorted fragments a slightly greater chance of getting through. Granted, DS is a very valid tactic. It is also a psych. tool because the IJ player knows the end is near and he has no Ruke Srywacker, no magic burret or other nuclear VunderVeapons. I lay the blame for not getting "enough stuff" through squarely on the Japanese players who aren't getting their stuff through. Loka is right. Kamis can get through Death Star to score hits, though losses are usually high. I always thought the real issue is that the code cannot handle huge A2A battles well, even with adaptions to pass numbers or the like. Or is this a non-issue by now? I haven't noticed it be an issue. What fixed it was that somebody noticed that there was an unintended buff to coordination being applied to LBA. This was causing repeated mass strikes. Once that bug was fixed, strikes tend to arrive much more fragmented and piecemeal, so you don't run into the issues. This creates its own mini-problem with lots of strikes arriving with no escorts while one or two strikes will hog all the escorts, but players can at least attempt to fix that on their own with unit settings/etc.